Traditionally,rabdi is a calorie rich dessert eaten on festive occasions. 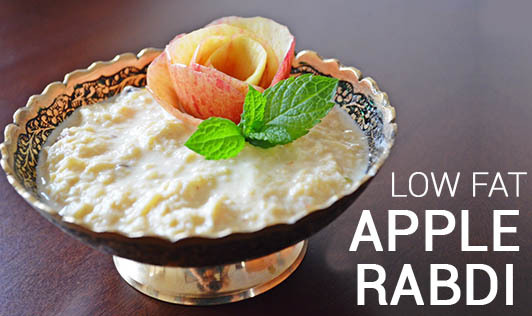 Low fat apple rabdi is made from low fat milk, apples and is a great dessert option for diabetics. • Boil milk in a deep non-stick pan and simmer it for 15 minutes, while stirring in between and scraping the bottom and sides of the pan. • Now add the grated apple, stir well and simmer for 5 minutes, while stirring in between and scraping the sides of the pan. • Add cardamom and nutmeg powder and mix well. Keep aside to cool. • Once the rabdi has cooled, stir in the sugar substitute. • Now refrigerate the rabdi for at least an hour. • Do not peel the apple as the skin of the apple is rich in fiber. • Always select sweet apple for this recipe. Sour apples will split and curdle the milk. • If you don't wish to use sugar substitute, then just reduce the quantity of sugar.